KLH Celebrates 25 Years of Machining | KLH Industries Inc.
On October 19, KLH Industries will celebrate 25 years in manufacturing by hosting a live broadcast of WKLH’s flagship morning show “Dave & Carole.” The program will coincide with a morning job fair, followed by an afternoon open house for KLH’s second facility, opened in 2011. The live morning show will feature 2-3 guest interviews from KLH Industries, including owner and Chief Executive Officer Kenneth L. Heins. An entrepreneur and philanthropist for the manufacturing industry, Heins recently represented the state of Wisconsin on the national NIMS apprenticeship council. WKLH 96.5 FM will broadcast their morning program “Dave & Carole” live from KLH Industries on Friday, October 19 from 5AM-10AM. We're looking for the workforce for the next 25 years. During the broadcast, KLH Industries will be seeking qualified listeners to fill several open positions. KLH seeks applicants looking to start or continue a career in precision machining. As a skilled workforce, KLH prefers technicians to have or be pursuing a state-indentured apprenticeship, however it is not a requirement at this time. KLH is currently accepting applications for EDM machinists, CNC machinists, and an experienced machining estimator. Applicants can submit their résumés in person or online at www.klhindustries.com/careers. On October 19, KLH Industries will celebrate 25 years in manufacturing by hostingOn October 19, KLH Industries will celebrate 25 years in manufacturing by hosting a live broadcast of WKLH’s flagship morning show “Dave & Carole.” The program will coincide with a morning job fair, followed by an afternoon open house for KLH’s second facility, opened in 2011. During the broadcast, KLH Industries will be seeking qualified listeners to fill several open positions. KLH seeks applicants looking to start or continue a career in precision machining. As a skilled workforce, most shop floor positions require employees to have served or be pursuing a state-indentured apprenticeship. 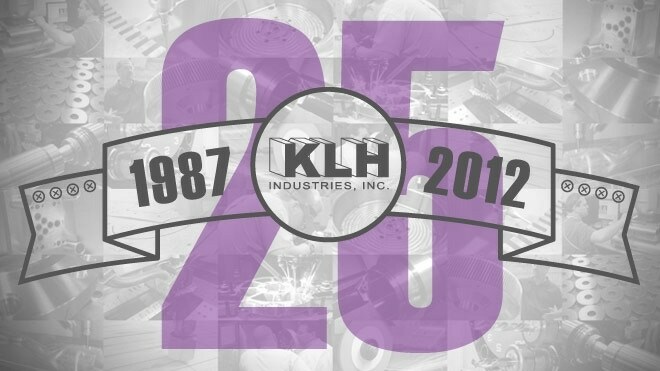 Following the radio broadcast, KLH Industries will be hosting an open house to showcase a recently renovated second facility. Guided tours will be traveling through both facilities on Fulton Drive, which are only 120 yards from one another. The open house will be open to the general public between the hours of 1PM-5PM. a live broadcast of WKLH’s flagship morning show “Dave & Carole.” The program will coincide with a morning job fair, followed by an afternoon open house for KLH’s second facility, opened in 2011. The open house will be open to the general public between the hours of 1PM-On October 19, KLH Industries will celebrate 25 years in manufacturing by hosting a live broadcast of WKLH’s flagship morning show “Dave & Carole.” The program will coincide with a morning job fair, followed by an afternoon open house for KLH’s second facility, opened in 20The live morning show will feature 2-3 guest interviews from KLH Industries, including owner and Chief Executive Officer Kenneth L. Heins. An entrepreneur and philanthropist for the manufacturing industry, Heins recently represented the state of Wisconsin on the national NIMS On October 19, KLH Industries will celebrate 25 years in manufacturing by hosting a live broadcast of WKLH’s flagship morning show “Dave & Carole.” The program will coincide with a morning job fair, followed by an afternoon open house for KLH’s second facility, opened in 2011. The open house will be open to the general public between the hours of 1PM-5PM.WKLH 96.5 FM will broadcast their morning program “Dave & Carole” live from KLH Industries on Friday, October 19 from 5AM-10AM.